Who is this man? What is he doing? 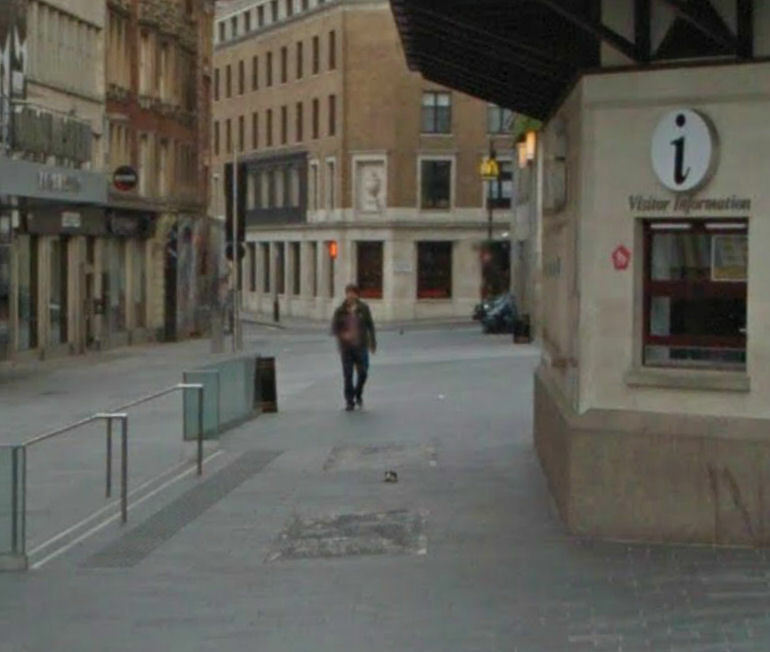 I was using Google Street View yesterday to locate a meeting point in Leicester Square (London) when I noticed a man who looked somewhat suspicious? 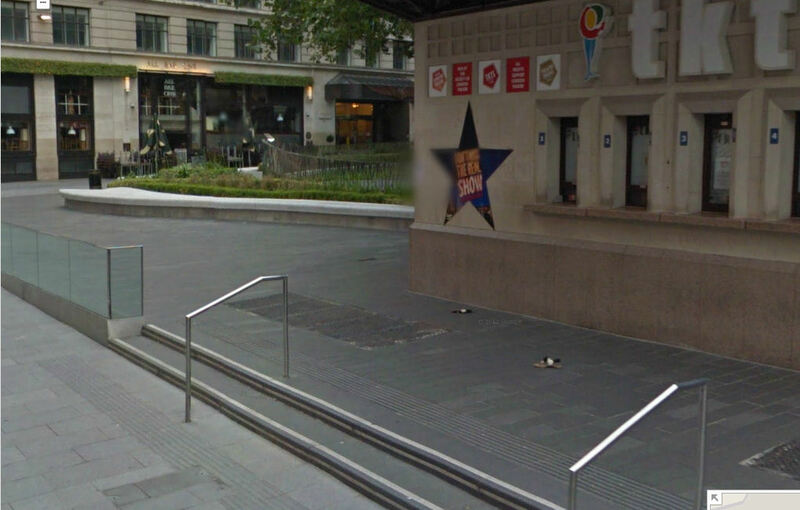 He is looking at the Google camera car and is holding a pair of quite feminine women’s sandals. I wondered what on earth he was doing? Okay, so this is hardly a Jack the Ripper type mystery, but I was curious and so using Street View I moved back and forth around this site to see if I could see how this situation arose? 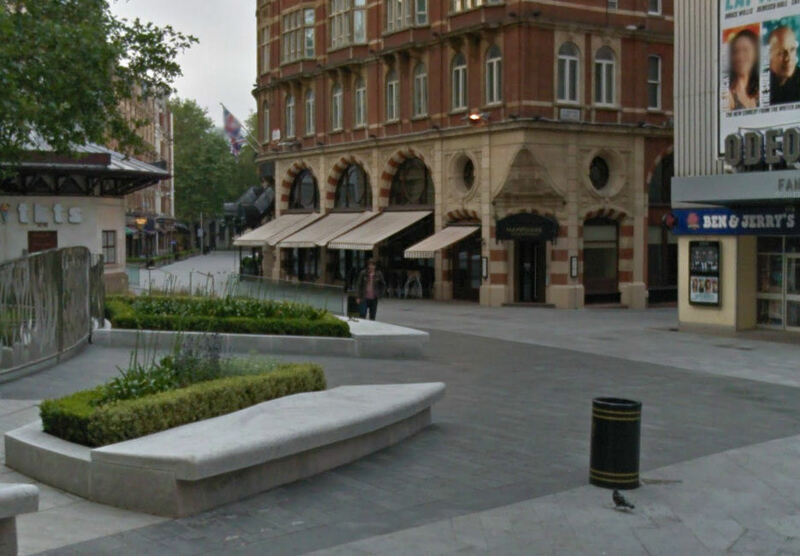 When Google captured the Leicester Square images, the area was completely empty. After moving around I could see, from the view outside All Bar One on Leicester Street, that the chap is there and the sandals are on the stone bench directly in front of him. 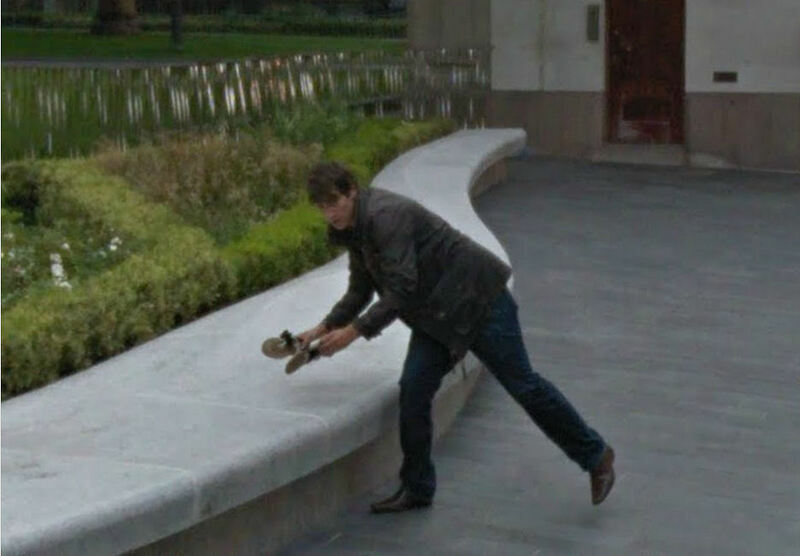 He is still looking directly at the Google car. So, mystery solved right? For whatever reason the guy sees the sandals and goes to pick them up and then puts them on the stone bench. Why in the shots immediately above is there only one sandal?! 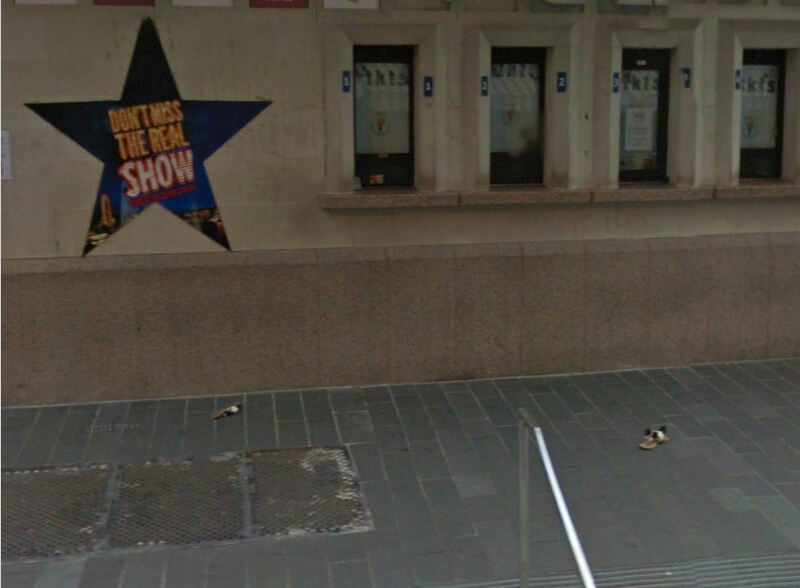 There are two sandals in the other shots, with one very close to the ticket booth and the other a couple of feet away. What happened to the other sandal? Where did the guy disappear to in-between the shots of the guy picking up/putting down the shoes to the ones where we see him walking towards the shoes? From other shots (e.g. on Leicester Street heading south) you can see a woman walking and from the change from shot to shot she has not moved very far so the Google car is capturing new images in only a couple of seconds, so where was the mystery guy? Why is the guy picking up the sandals? He is not just putting them out of the way of passers by, he picks them up and takes them all the way to the corner of the Square and puts them down directly in front of where he is standing. Is he taking them home for his girlfriend/wife/himself? Why is he looking so suspicious? 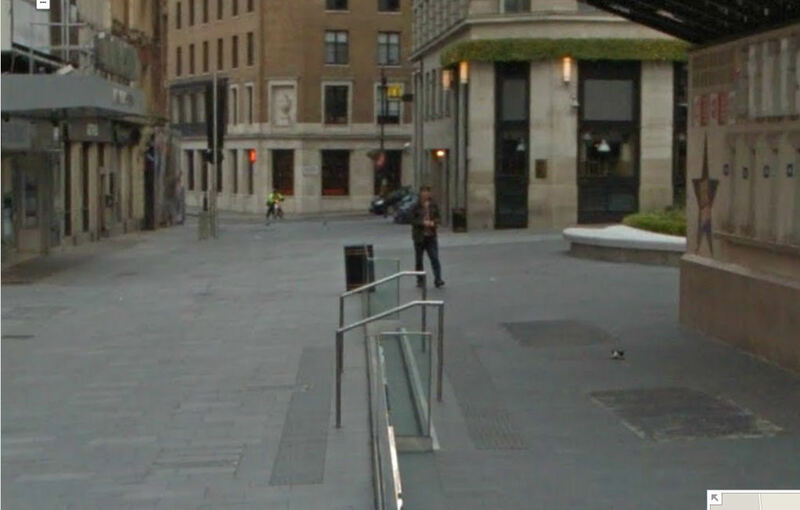 No other person in Leicester Square captured is looking at the Google car so intently? The shots of him from Leicester Street are of him facing the car, normally people face outwards from the Square if they are waiting? Is he putting down or picking up the sandals in the initial photo? His pose is one of a person doing this in a hurry rather than casually. Is he about to scarper off with the women’s sandals or is he rushing to put them down before anyone notices but is too late? Did he actually pick the sandals off the ground? Or did he put/throw them there? It is hard to tell what the sequence of events is from the way the Google car captured the images. This is not as simple as it may seem. Do you have a theory of what happened?